We are currently tracking a wintry storm that will move through the region tomorrow. We’ve been updating Premium subscribers all day about the potential for school impacts tomorrow. In a previous Storm Threat Alert we updated our expected timing of the system as it moves through the region. 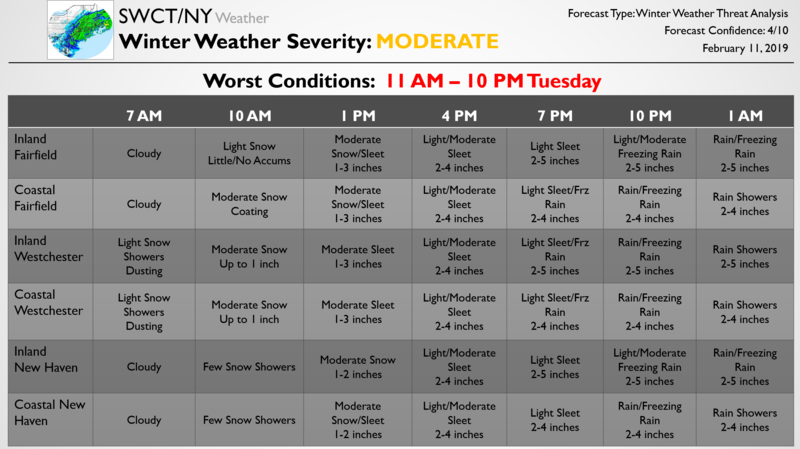 It recent updates the storm has been delayed about one hour from what is seen below, but generally accumulation and timing expectations remain the same. 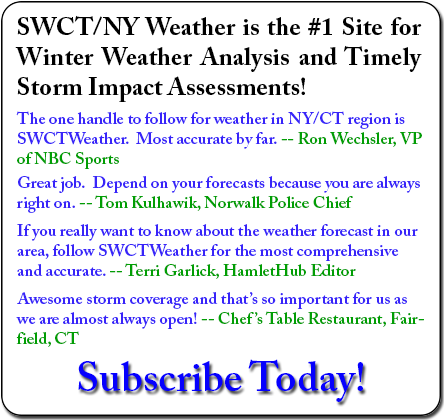 The storm should start as snow late tomorrow morning with snow finally moving into New Haven County between 10 AM and 12 PM. Snow turns to sleet between 1 and 4 PM across the region, with freezing rain taking over between 4 and 6 PM. Freezing rain turns to plain rain between 7 and 10 PM at the coast and between 10 PM and 1 AM inland, with some far inland regions still seeing patchy freezing rain even a bit later. Eventually, the whole region is plain rain by early Wednesday morning as the showers move out. Along with the list snow/sleet accumulations we are watching for up to a tenth of an inch of ice at the coast and between .1 and .25 inches of ice inland, with the largest ice accretions likely to be far inland (around and particularly north of Interstate 84). Should the forecast change significantly we will send along another free Update. 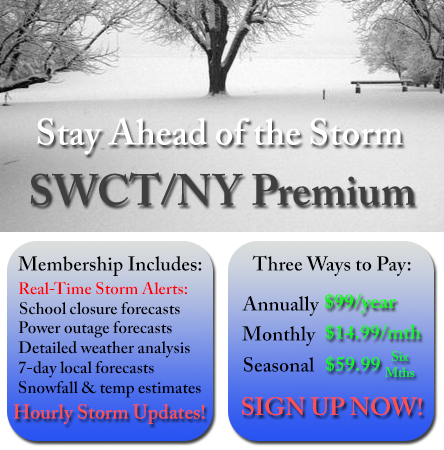 Sign Up For SWCT/NY Weather Premium!